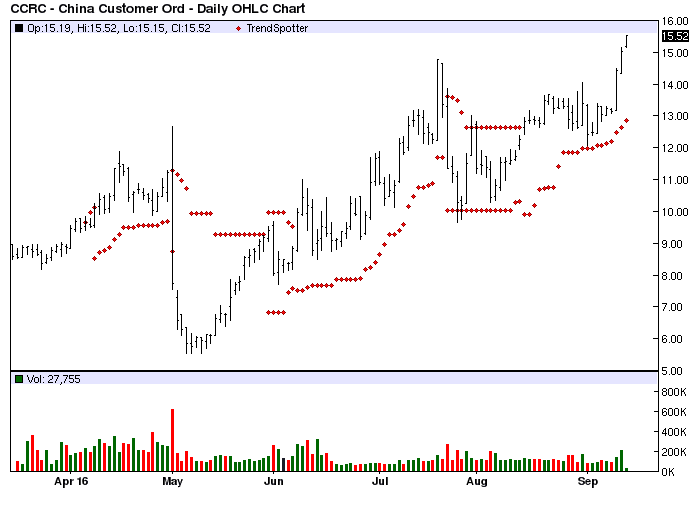 This morning China Customer Relations Centers (CCRC) is the Chart of the Day. Today selection was made by default. At 10 AM this is the only stock in the Barchart data base to hit an All Time High. Since the Trend Spotter signaled a buy on 8/15 the stock gained 19.94%. China Customer Relations Centers, Inc. provides call center business process outsourcing. The company focuses on the voice-based segment of customer care services. It offers customer relationship management, technical support, sales, customer retention, marketing surveys and research services. China Customer Relations Centers, Inc. is headquartered in Tai'an, the Peoples Republic of China.